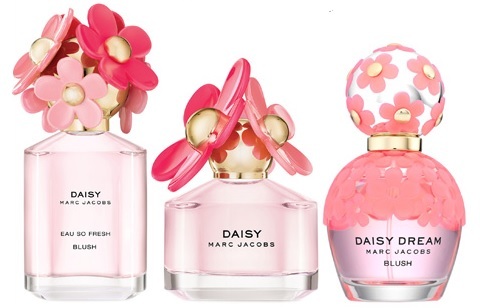 Marc Jacobs has added a touch of Blush to the Daisy collection with everything from the scents to the bottles being re-imagined in pink! Daisy Eau So Fresh Blush - 75ml EDT - $100 - a warm and radiant scent with top notes of mandarin, apple and pink grapefruit; heart notes of rose, lily of the valley and freesia; and base notes of apricot nectar, cedarwood and musk. Daisy Blush - 50ml EDT - $90 - a sparkling and spirited scent with top notes of water lily, frozen pear and bergamot; heart notes of lily of the valley, mimosa and honeysuckle; and base notes of skin musks and precious woods. Daisy Dream Blush - 50ml EDT - $90 - an airy and lush scent with top notes of violet leaves, waterlily and bergamot; heart notes of rose, lily of the valley and freesia; and base notes of vetiver and clean musks. I love all things pink so this collection was a no-brainer for me, but if forced to choose, Eau So Fresh Blush would be my fave - the fresh and fruity scent just screams summer! Available now at The Bay, Sephora, Shoppers Drug Mart and Jean Coutu. Aim To Misbehave with Essie's 1000th shade! Essie Summer 2016 Collection - with swatches! Test Driving - Schwarzkopf color ULTÎME! Essie 2016 Bridal Collection - with swatches! OPI Soft Shades 2016 - with swatches!